Researchers have long explored how music affects the mind. For example, can listening to music boost academic performance, alleviate depression or help kids become better learners? Several studies have shown that music can influence our ability to think, learn and remember – and even connect with the people around us. One fascinating area of research is how people with Alzheimer’s disease and other types of dementia can benefit from music. This question is especially compelling in the face of sombre statistics: the Alzheimer Society of Canada reports that 564,000 Canadians live with dementia; 15 years from now, that number is expected to surpass 930,000. Alzheimer’s disease and other types of dementia can cause memory problems that affect day-to-day activities, difficulties with language, changes in mood and behaviour, disorientation in time and place, and other effects. As dementia progresses, cognitive and functional abilities continue to decline, and eventually the person loses the ability to communicate verbally. There is not yet a cure for Alzheimer’s disease or several other kinds of dementia, but you can take steps to reduce your risk. The area of the brain associated with musical memory tends to be least affected by dementia. People can often recall music from their teens and 20s. Music appreciation is one of the last cognitive skills to be affected by dementia. Music therapy may help reduce cognitive decline and enhance quality of life. Music may improve the memory of people with dementia. In one study, test subjects performed better on memory tests when they listened to classical music. The emotional content of music can bring back emotional memories. Music can reduce anxiety, depression, stress and agitation. Singing can increase brain activity. One study found that participating in small group music sessions improved the cognitive abilities of people with moderate to severe dementia. 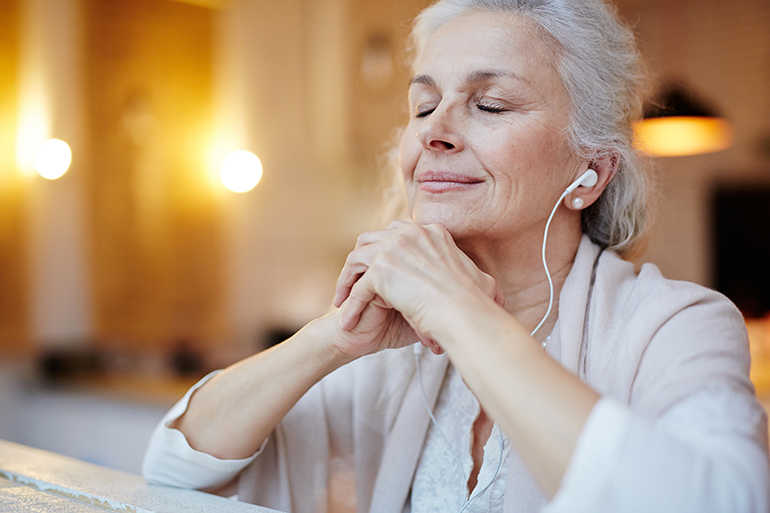 Personalized music and memory therapy may improve symptoms and reduce the usage of anti-anxiety and anti-psychotic medications in people living with dementia. Researchers are studying whether music could help people with dementia learn new things and form memories. Alive Inside explores music’s potential to revitalize people with dementia by evoking emotions and memories. The film also shows how music can help people reconnect and socialize with others. In care facilities that have adopted the Music & Memory program, participants are happier and more social; relationships among participants, families and staff members deepen; and there are fewer behavioural issues. People with dementia may become agitated, aggressive or anxious. Soothing music can help calm or lighten their mood. When creating playlists, look for songs with special meaning for your loved one, such as favourite tunes from their teenage years. If you need ideas, ask family members for input (they may also appreciate the opportunity to help). Start with something gentle and play it softly. To avoid overstimulation, turn off the TV and other sources of noise. Enjoy music with your loved one by listening to songs together, singing, playing instruments or dancing. Music can evoke negative emotions and memories as well as positive, happy ones. When playing music for someone with dementia, watch how they react. If they appear to be enjoying it – singing, humming, tapping their feet – that’s a good sign. But if they become uncomfortable or upset, take a break and try again another time, with different songs.